A friend of mine and I have come up with the idea to do something interesting with mechanisms. We're thinking of building a multi-legged walking machine. I'd like to use this page to document the journey. Create a human powered walking machine (powered by one or two people). Have basic walking function on flat terrain (dirt or asphalt). Climbing a curb would be nice, but that's phase II. Make something cool and unique. Play with tools and metal. Step #1, Which Mechanisms Make Sense? I found an interesting overview of walking mechanisms in a Doctorate Dissertation submitted by Win-Bin Shieh, to the University of Maryland, 1996. The submission is entitled "Design and Optimization of Planar Leg Mechanisms Featuring Symmetrical Foot-Point Paths." In the Thesis, the author reviews many different alternatives for systems design. Of note, Win-Bin Shieh identifies six "admissible" one degree-of-freedom (DOF) planar four-bar, six-bar and eight-bar mechanisms with desirable features. Here are the results of the six "admissible" mechanisms, extracted by Win-Bin Shieh's paper. Are these perfect? Probably not, but it's definitely a place to start a conversation. Remember, Win-Bin Shieh is actually looking for fully functional walkers, and he is creating mechanisms that have TWO degrees of freedom (DOF). His search criteria is to find one DOF mechanisms that lend themselves to a two DOF functionality. (Hint: read the paper...) That's not exactly what we want to do. This means the Win-Bin Shieh mechanisms are of great interest, but nothing we have to absolutely lock ourselves into. For our experiment, we'd like to examine three mechanisms, one four-bar, one six-bar and one eight-bar design. This should keep things interesting. For this exercise, I'm going to rely on previous work done by the folks at Saltire Software. Their work is downright brilliant. They offer Mathematical Technology for Industry and Education. They create software for engineers and educators. I'm looking at samples of work that appears to have been created by the Saltire tool Geometry Expressions. Specifically I'm looking at an example showcased in their Geometry Applet Gallery, Four Bar Linkage. What's really awesome about this tool is the ability to drag and drop to modify the linkage design and immediately see the output path. I'd like to use their example, and modify it just a little bit. I'm going to make the viewing area larger, and I'm going to create a method to export the final mechanism design characteristics to a CAD program. Ugh. Update. Drag and drop is pretty cool, but frankly, typing in numbers manually is MUCH more controlled. I'm going to re-think this one. In fact I'm going to use a different tool provided by Saltire Software, this time the example is coming from their tool Mechanical Expressions. Specifically, we're going to be exploring their Kinematics Examples . Again, we're going to rely on the work done before us, again from Saltire Software. This time, we're looking at a different sample six bar linkage in their Geometry Applet Gallery, the Six Bar Linkage . Same as the previous sample, we can drag and drop key design elements until we obtain an optimal mechanism. Do note, for this mechanism, we'd like to start with a Klann Linkage.. but Ouch!.. Turns out the sample from Saltire, although identified as a Stephenson mechanism, isn't quite convertible to a pure Klann mechanism. So no what you are looking at is definitely NOT a Klann walker. Check step #5 below to see a real Klann linkage. Next we'd like to examine an eight bar mechanism. For this mechanism, we'd like to start with the design by the kinetic sculptor and artist, Theo Jansen. If you've never seen the work it is beautiful and mesmerizing at the same time. You can't take your eyes off the motion. I've discovered a very nice analysis of the Theo Jansen mechanism by Gareth Rees, and I'd like to use that sample here. I will say, I'm very impressed by the software work done here by Gareth (and Heltonbiker, the person who wrote the original code in Python). Gareth is utilizing the Sylvester JS library to do much of the vector / matrix / geometry calculations involved. The Theo Jansen 8 bar mechanism is classified as a type (5, 2, 1, 0); five binary links, two ternary links and one quaternary link (consisting of four joints). There are no quintanary links on any 8 bar mechanism, hence the final zero in the classification. We chose to start with this mechanism because it is very well documented, copied and analysed. Ground Score = the amount of time spent on the ground as a percentage of input crank rotation. "On the ground" is relative, but in this case, its all points whose y-coordinate is within some tolerance of the lowest point observed. On the path below, the Ground Score is shown in red on the output curve. Drag Score = the biggest difference between any two horizontal velocities while the foot is on the ground. Oops. Big oops. Remember we started our analysis with the paper presented by Win-Bin Shieh in step #1 above. We want to find a mechanism that is highly functional. It turns out that one of Win-Bin Shieh's assumptions for determining an optimal 8 bar mechanism is that mechanisms with quaternary links are excluded from analysis. Win-Bin did this to "prevent complex mechanism structure" and to make the legs more compact. I can't really argue with this, as one negative aspect of the Theo Jansen mechanism is there are only two connections to ground, and one of those is a rotary driving element. This means the legs are rather fragile with regards to potential side loading. I'd much prefer to have a leg with three or more connections to ground. One of our goals is to make a device that can be turned, so side loads are of great concern. So without further ado, here is a "standard" Klann Linkage. The Klann linkage was developed by Joe Klann in 1994 as an expansion of Burmester curves which are used to develop four-bar double-rocker linkages. The Klann linkage, (patented in 2001) is categorized as a modified Stephenson type III kinematic chain. Note: it appears the patent has expired on 17 July 2013 for non payment of maintenance fees. I had never noticed before, but the crank input direction on the Klann mechanism is opposite from that of the Theo Jansen mechanism. I reversed the crank input direction, but when I did that the analysis tools quit working. (Sigh...) Gotta figure it out in details of the code. I did say one of our goals in this exercise was to play with software! 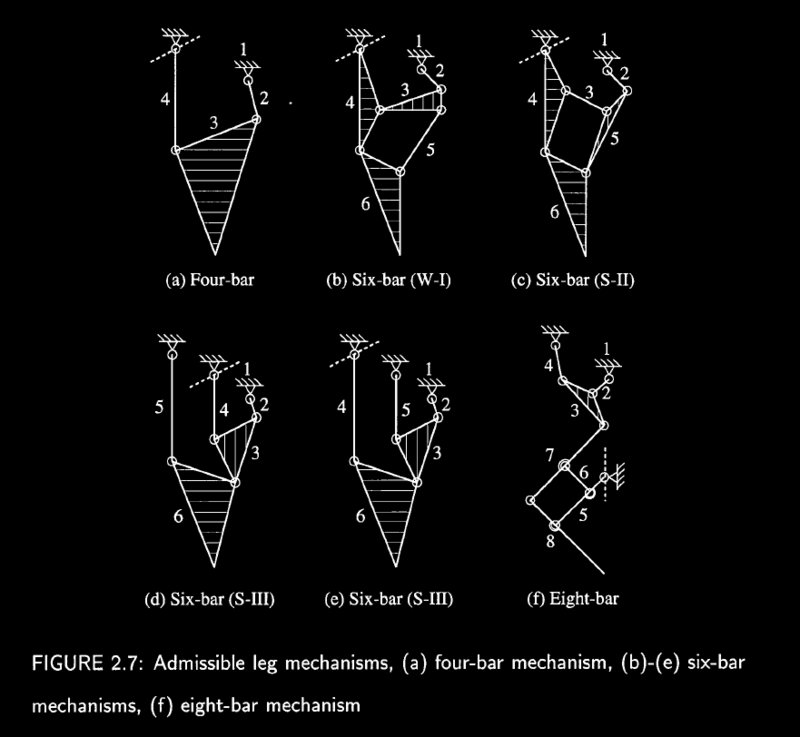 Let's first try the four bar linkage plus cognate = six bar walking mechanism based on Mehdigholi and Akbarnejad's "Optimization of Watt's Six-bar Linkage to Generate Straight and Parallel Leg Motion". That mechanism concept is not specifically shown on the Win-Bin Shieh recommendations, but its well documented and seems to have a very simple and smooth motion. If we can get the foot motion to drive in > 180 degrees of input shaft motion, this mechanism, with its unusual crank driver, might be a convenient way to use less legs. In fact, I've seen models of this mechanism with only four legs in total. Hmmmm.. I found an other weblink that describes in great detail how to create a cognate and use it to modify a four bar mechanism. In fact they use the same example as Mehdigholi and Akbarnejad. (M&A) Check out example 4.9 on this page. The instructor on that page refers to the mechanism that Mehdigholi and Akbarnejad start with as a Chebyshev Lambda or Hoecken straight line mechanism. The link proportions are those refered to by M&A. I really like how smooth this mechanism works, but I'm just not sure how easy it would be to build if you had two legs (180° out of phase) on each corner of our our human powered vehicle. There is a double crank driver and I'm just not sure how everything will fit. With that said, lets model it and see what happens. Remember we said our goal is to do something unique, well here's our shot. I'm thinking the 8 bar recommendation from Win-Bin Shieh might be original enough. One thing about that form is there are three ground pivots and one of them is fairly near the walking foot. That should help keep the linkage on plane particularly while the vehicle is turning. Lets model it here to determine an optimal path. One thing I will say, is it sure seems like there is a lot going on with that 8 bar mechanism... there are a whole lot of joints and parts involved. There is one minor item of note. The eight bar mechanism actually proposed by Win-Bin Sheih in section 4.5 of his paper is very slightly modified from that originally shown in the Win-Bin Sheih summary above. Without the modification we were unable to simulate the mechanism; we couldn't pass the "Dem Bones" criteria. This mechanism uses a pantograph to 'enlarge' the output of the top four bar component mechanism. Makes for an interesting mechanism. You can move point C (x,y) around a bit and modify the output with that one move. Want a different 'gearing' / stride length? Do you want to pick up your feet higher for rough / steep terrain?